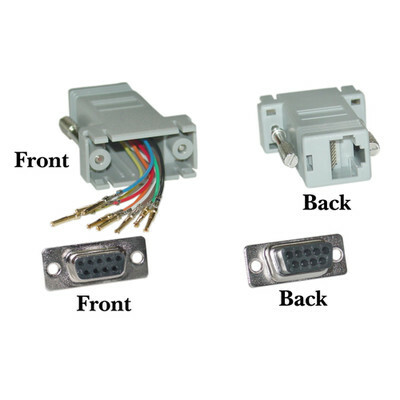 More Product InfoOur DB9 to Ethernet adapter transforms a DB9 male connector into an RJ45 female port, updating your serial data interface for network communication. It is commonly used to convert a 9-pin serial port to a phone jack, network jack and other custom pin-out configurations over long distances. This modular RS232/RJ45 adapter has a DB9 female plug with flying leads so you have a larger margin of error when you insert the pins. This bidirectional DB9 to RJ45 converter is backed by our expert technical support and service. Does the job at a good price. Quality product. The company that I work for has reviewed their catalog and will use Cablewholesale for all of their cabling needs. great item at an unbeatable price.